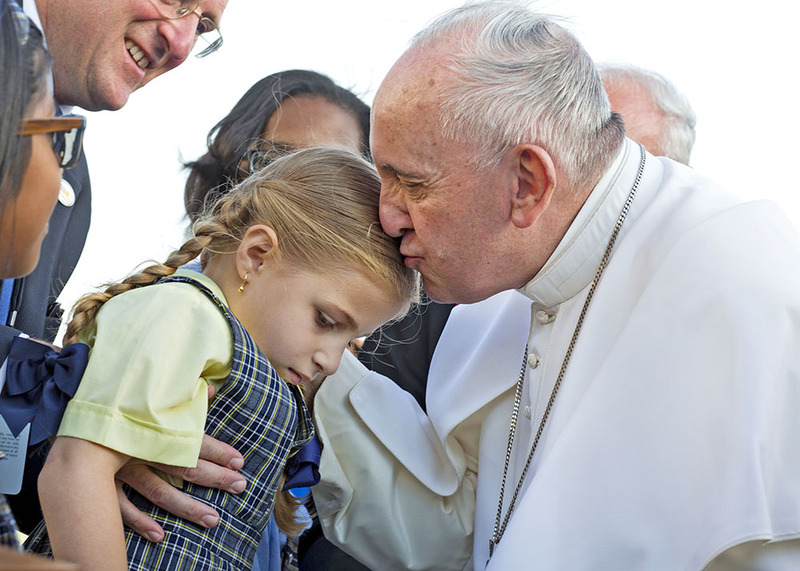 Pope Francis is greeted by Maria Teresa Heyer, a first-grade student from Brooklyn, during his arrival at John F. Kennedy International Airport Sept. 24, 2015, in New York City. 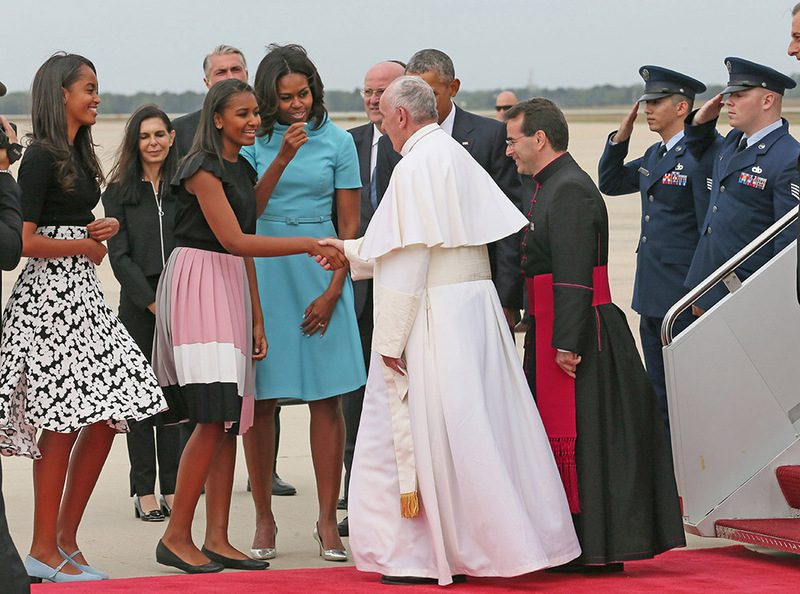 The pope is on his first trip to the United States, visiting Washington, D.C., New York City and Philadelphia. 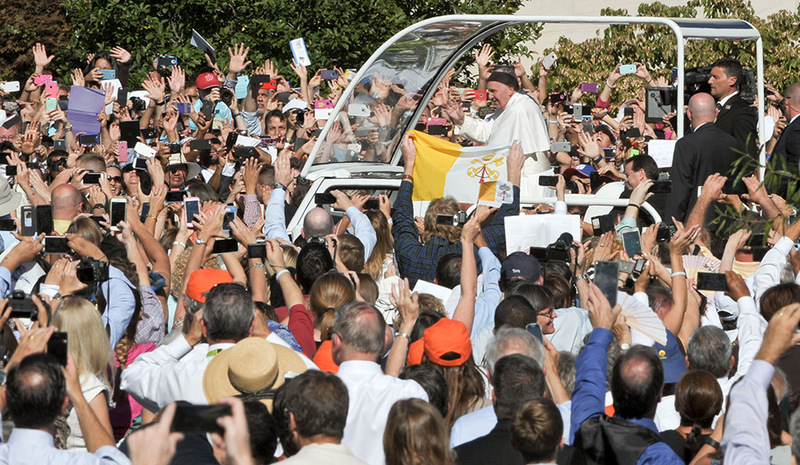 Pope Francis arrives by motorcade to celebrate a Mass and canonization of blessed Father Junipero Serra at the National Shrine of the Immaculate Conception in Washington D.C, Sept. 23, 2015. 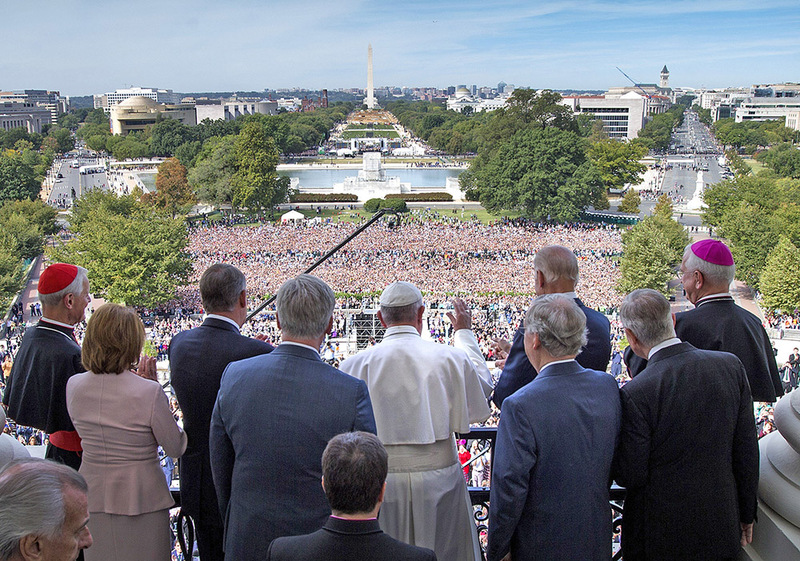 Pope Francis on Capitol lawn, D.C.
Pope Francis waves to the crowd from the Speaker’s Balcony at the U.S. Capitol, Sept. 24, 2015, in Washington, D.C. Pope Francis will be the first pope to ever address a joint meeting of Congress. 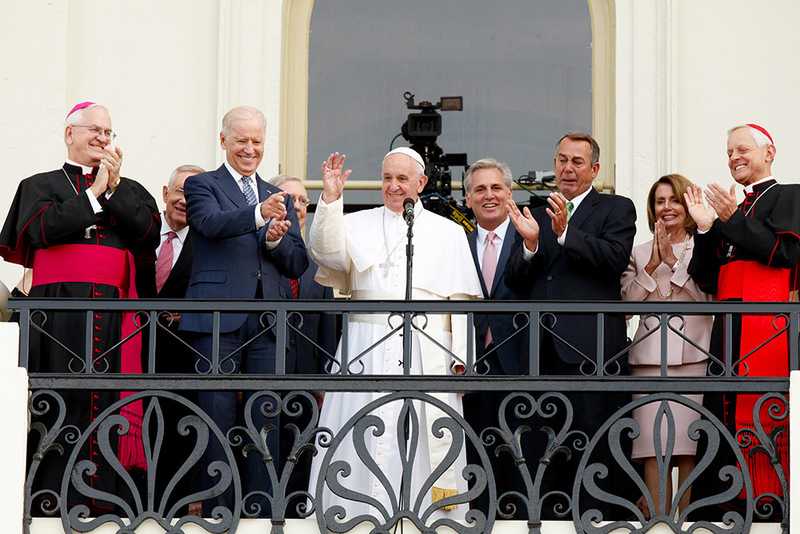 Pope Francis at the Capitol, D.C.
Pope Francis waves to crowd from the balcony of the U.S. Capitol after his address to a joint meeting of the U.S. Congress, as (L to R) Archbishop Joseph E. Kurtz, Senate Minority Leader Harry Reid, Vice President Joe Biden, House Majority Leader Kevin McCarthy, Speaker of the House John Boehner, House Democratic Leader Rep. Nancy Pelosi and Cardinal Donald Wuerl look on Sept. 24, 2015, in Washington, D.C.
Reporters watch from their gallery as Pope Francis addresses a joint meeting of the U.S. Congress in the House Chamber of the U.S. Capitol on Sept. 24, 2015, in Washington, D.C. Pope Francis is the first pope to address a joint meeting of Congress and will finish his tour of Washington later today before traveling to New York City. Pope Francis meets with Gerard Gubatan of Brooklyn during his arrival at John F. Kennedy International Airport Sept. 24, 2015, in New York City. 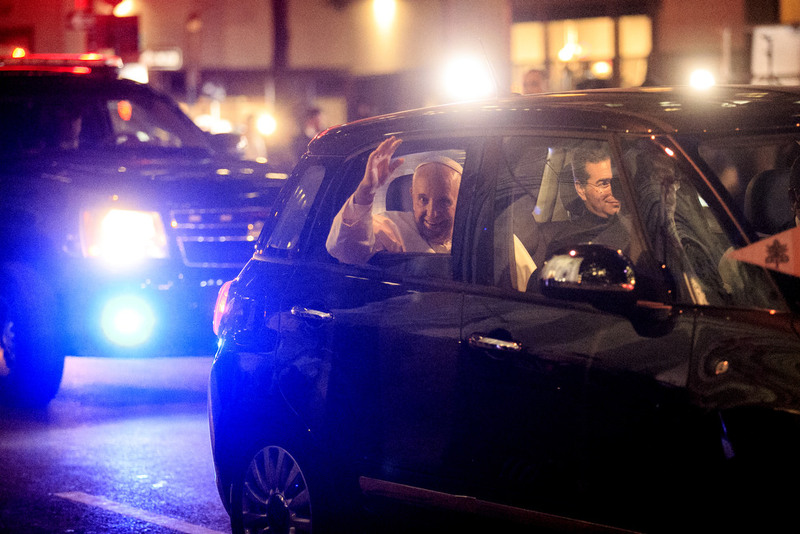 The pope is on his first trip to the United States, visiting Washington, D.C., New York City and Philadelphia. 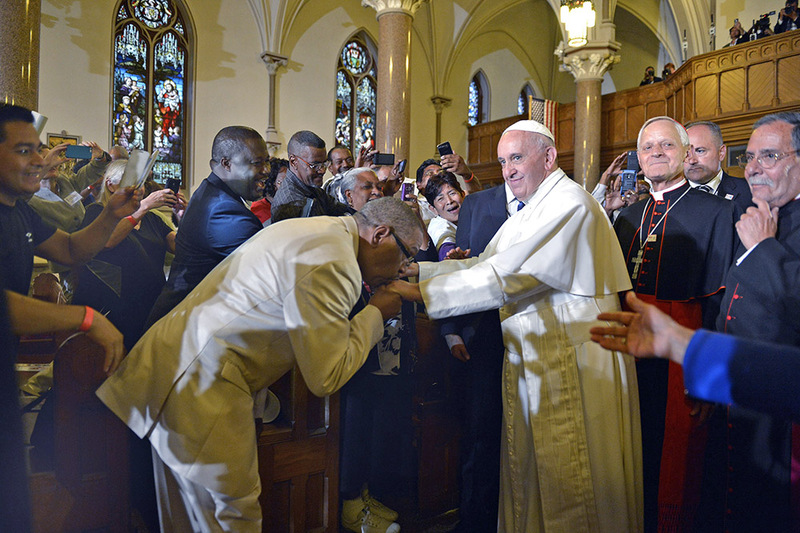 Pope Francis is greeted by Trenton Shepherd of Washington, D.C., who kisses his hand upon the pope’s arrival at St. Patrick’s Church, Sept. 24, 2015, in Washington, D.C. 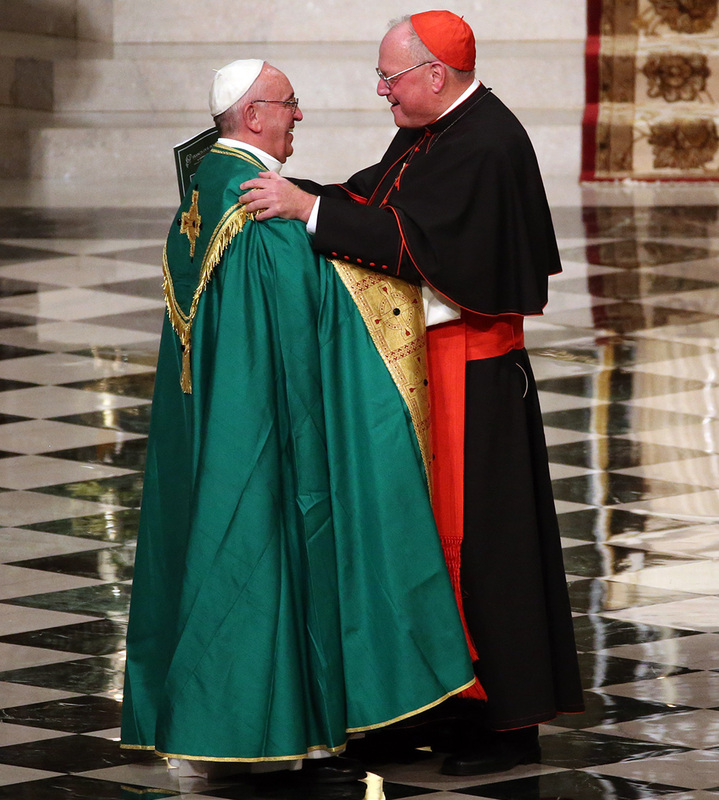 The pontiff concludes his visit to Washington and continues on to New York City later in the day. 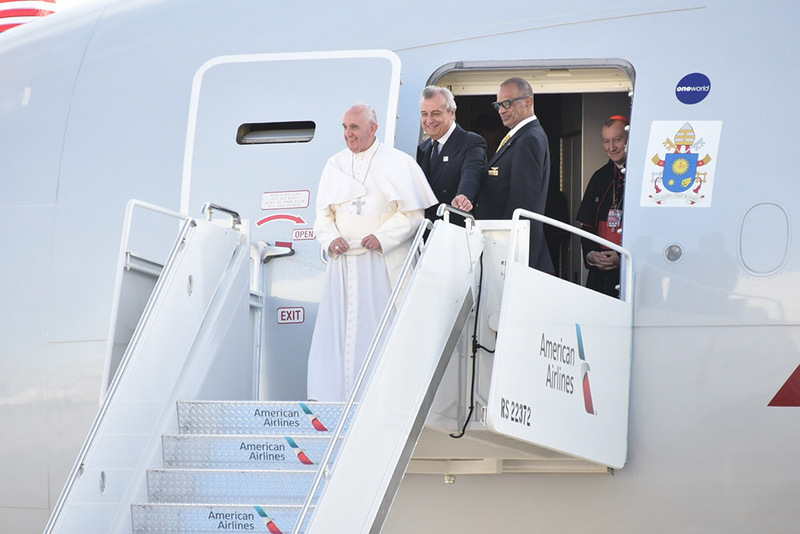 Pope Francis arrives at John F. Kennedy International Airport, Sept. 24, 2015, in Queens, New York City. He flew American Airlines. 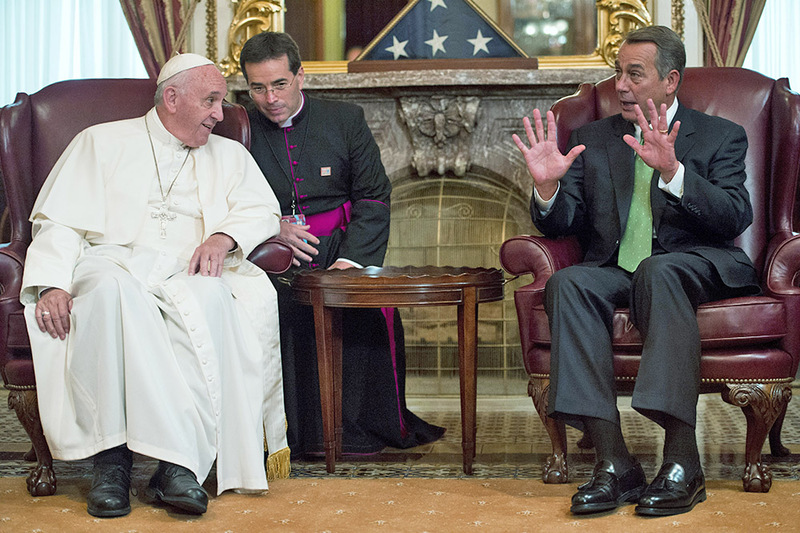 Speaker of the House John Boehner speaks with Pope Francis in the U.S. Capitol before the pontiff speaks to a joint meeting of Congress Sept. 24, 2015, in Washington, D.C. Pope Francis will be the first pope to ever address a joint meeting of Congress. Twenty-four hours after meeting the pope, John Boehner announced he was stepping down as Speaker of the House and leaving Congress after the end of October. 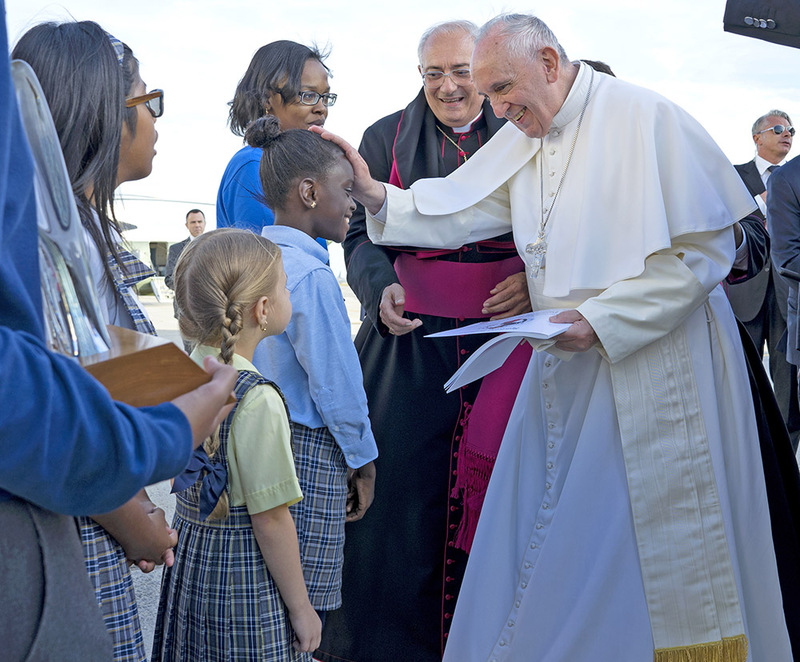 Pope Francis reaches out to fifth-grader Omodele Ojo of East New York, Brooklyn, during his arrival at John F. Kennedy International Airport Sept. 24, 2015, in New York City. 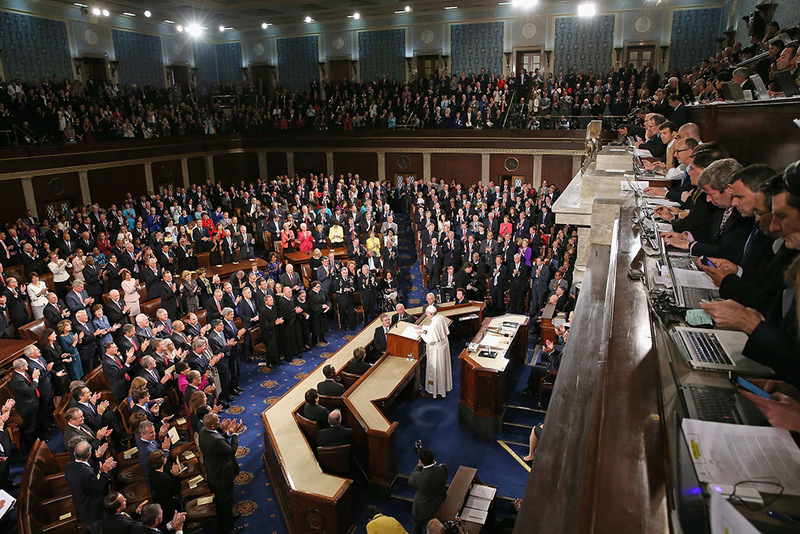 The pope is on his first trip to the United States, visiting Washington, D.C., New York City and Philadelphia. 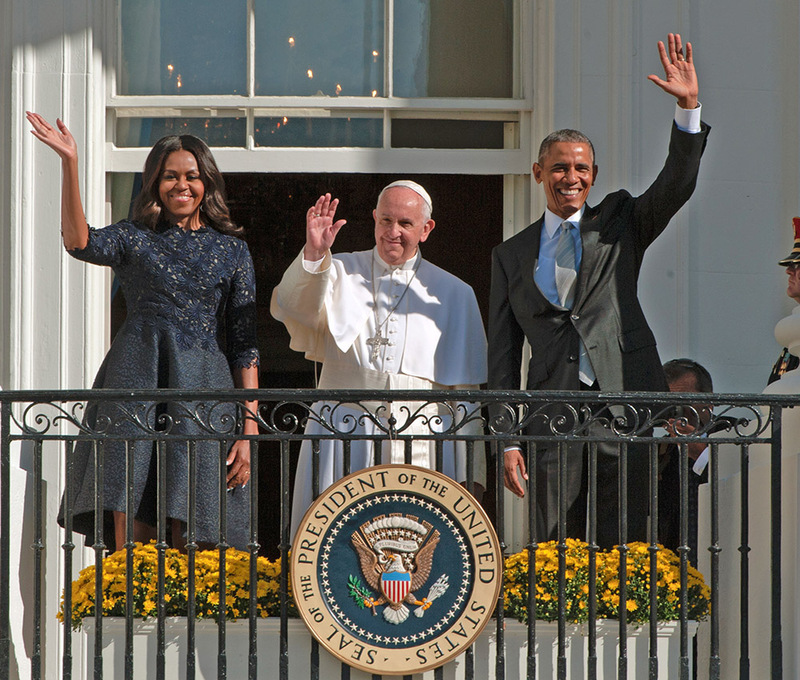 U.S. President Barack Obama and first lady Michelle Obama wave to the crowd with Pope Francis during a state arrival ceremony on the south lawn of the White House, Sept. 23, 2015. 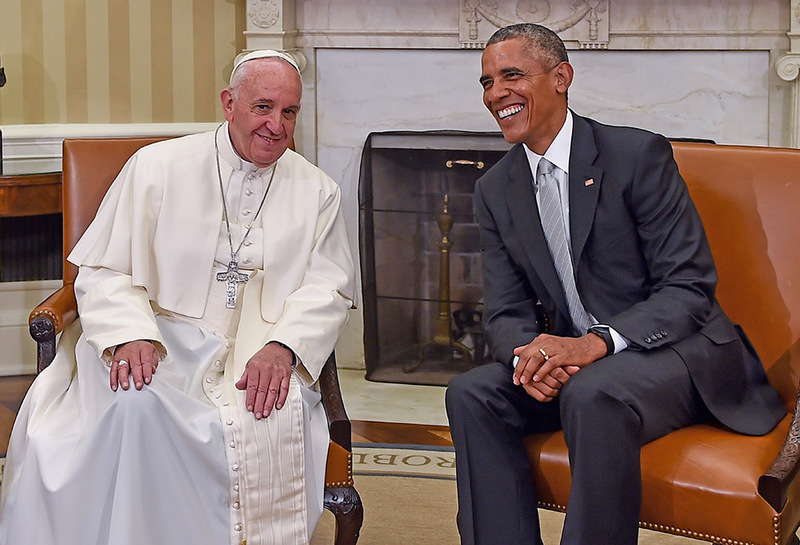 Pope Francis arrives in the United States and is greeted by President Obama and his family, Sept. 22, 2015, in Washington D.C.
U.S. President Barack Obama speaks with Pope Francis in the Oval Office at the White House, Sept. 22, 2015. 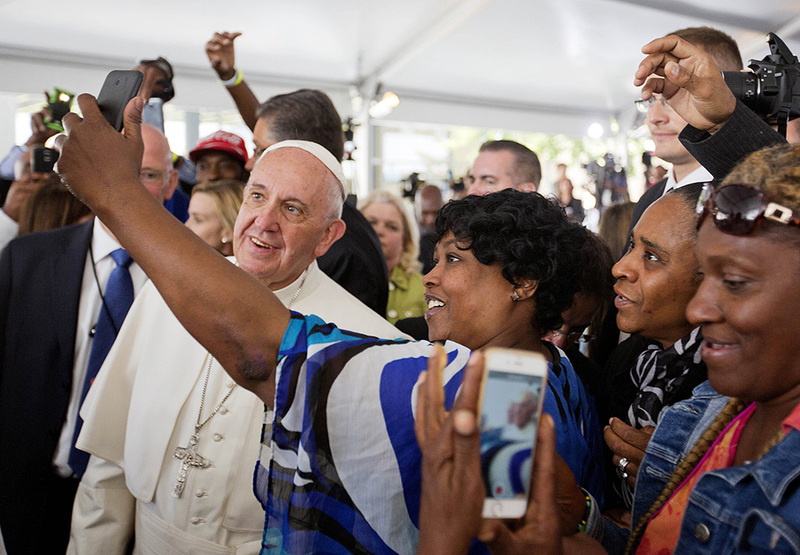 Cartrice Haynesworth, center, has a selfie taken with Pope Francis, left, as he walks through the crowd during a visit to Catholic Charities of the Archdiocese of Washington Sept. 24, 2015, in Washington, D.C. Pope Francis is in the United States for six days during his first trip as the leader of the Roman Catholic Church. 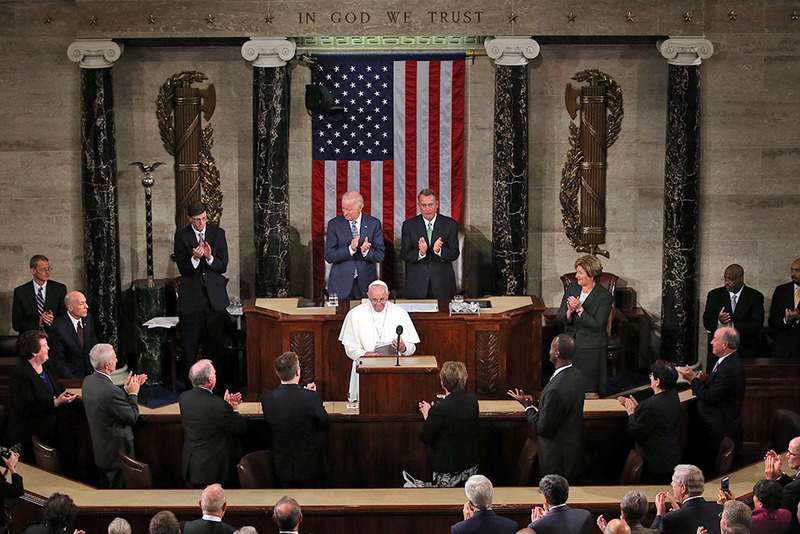 Vice President Joe Biden and Speaker of the House John Boehner applaud Pope Francis after his speech in a joint meeting of the U.S. Congress in the House Chamber of the U.S. Capitol on Sept. 24, 2015, in Washington, D.C. Pope Francis is the first pope to address a joint meeting of Congress. 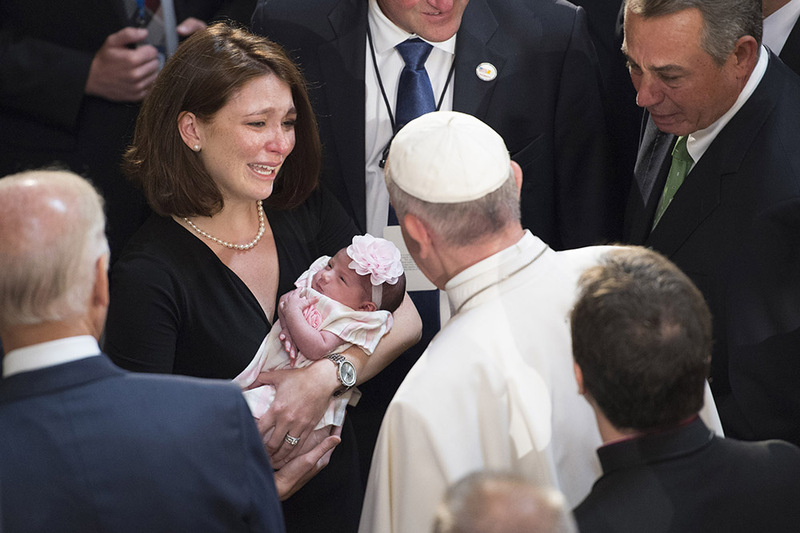 Pope Francis with Senate and newborn, D.C.
Pope Francis blesses an unidentified child beside Speaker of the House John Boehner and Vice President Joe Biden in Statuary Hall in the U.S. Capitol Sept. 24, 2015, in Washington, D.C.
Pope Francis embraces Cardinal Timothy Dolan during vespers at St. Patrick’s Cathedral Sept. 24, 2015, in New York City. 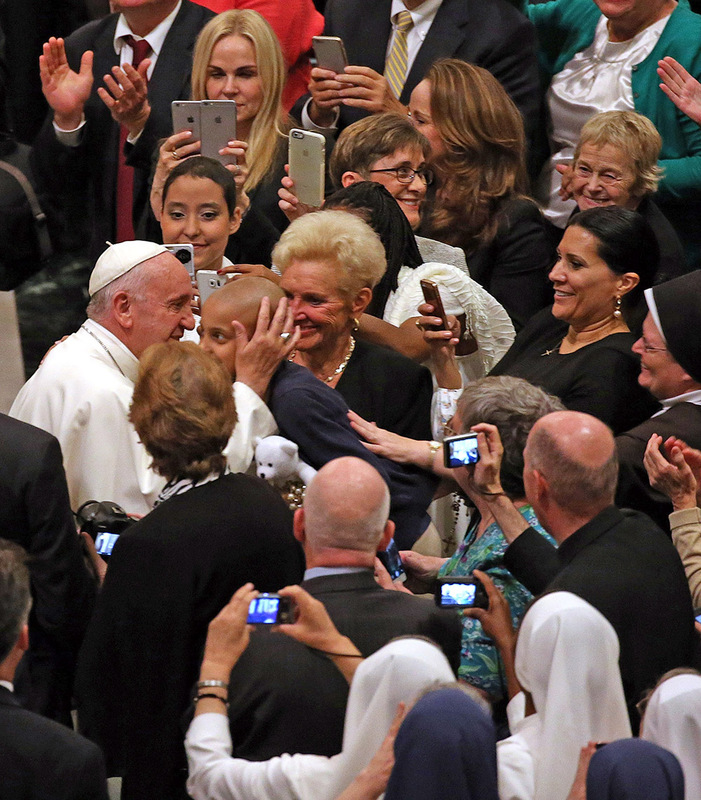 Pope Francis kisses a young girl as he arrives at St. Patrick’s Cathedral Sept. 24, 2015, in New York City. 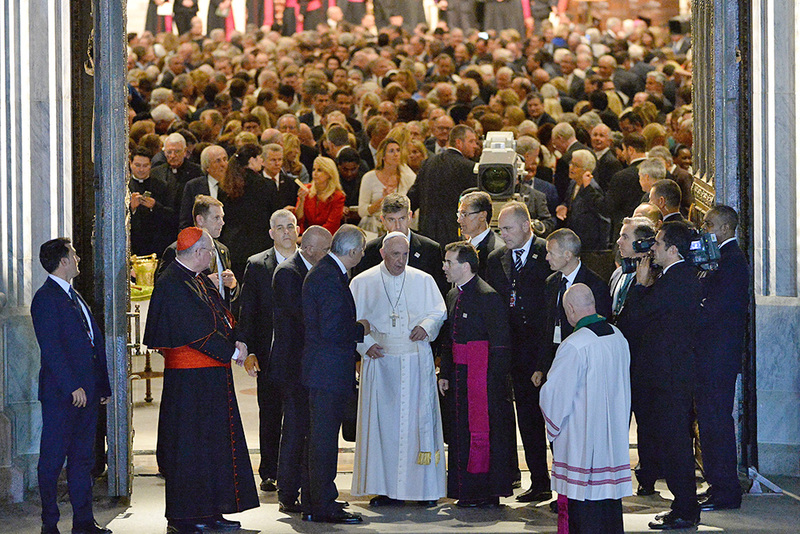 Pope Francis leaves after celebrating evening Mass at St. Patrick’s Cathedral Sept. 24, 2015, in New York City. The pope is on a six-day visit to the U.S., with stops in Washington, D.C., New York City and Philadelphia. 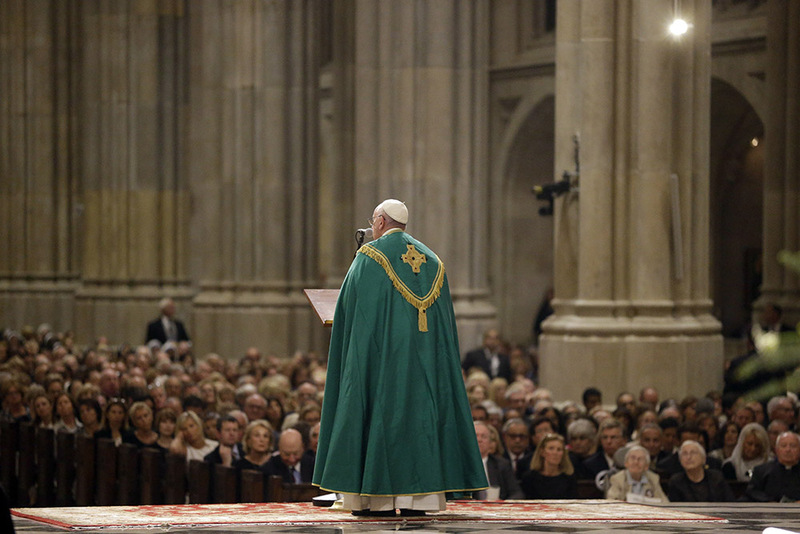 Pope Francis leads the evening prayer service at St. Patrick’s Cathedral Sept. 24, 2015, in New York City. 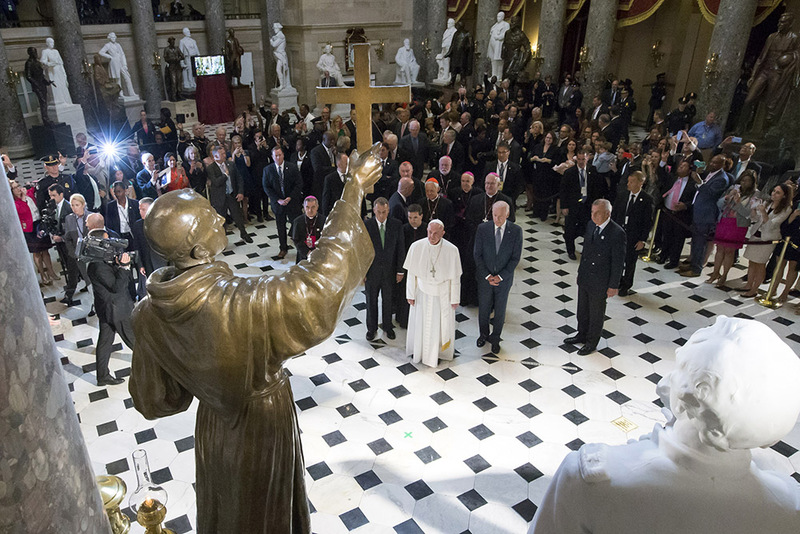 Pope Francis with Senate, Washington, D.C.
Pope Francis pauses in front of a sculpture of Spanish-born Junipero Serra, the Franciscan friar known for starting missions in California, in Statuary Hall in the U.S. Capitol on Sept. 24, 2015, in Washington, D.C.
Pope Francis leaves St. Patrick’s Cathedral in a Fiat 500L on September 24, 2015 in New York City. 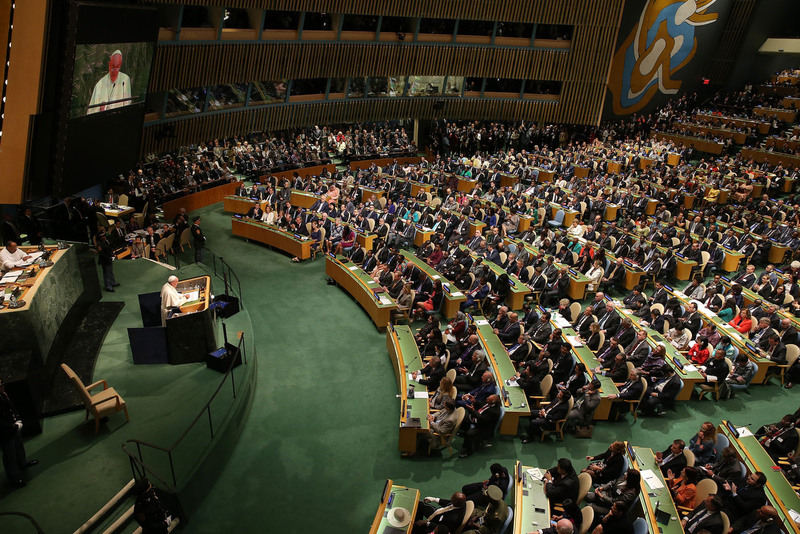 Pope Francis addresses the United Nations General Assembly on Sept. 25, 2015 in New York City. 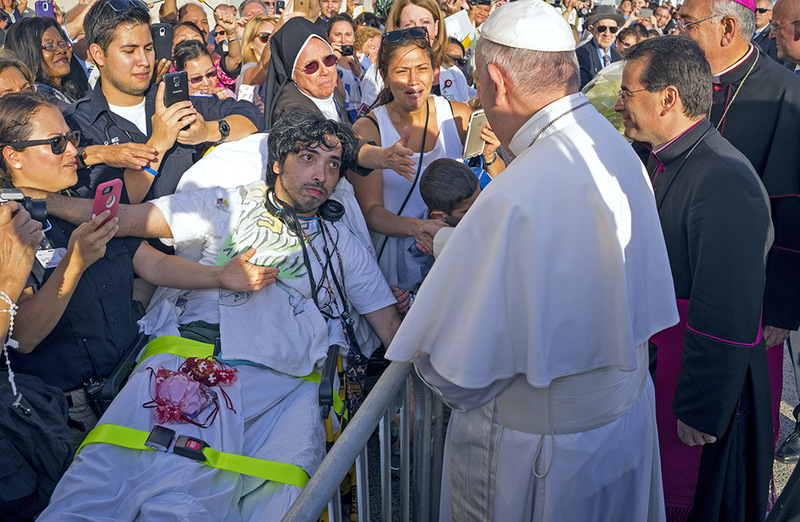 Pope Francis pauses during a visit to Ground Zero on September 25, 2015 in New York City. 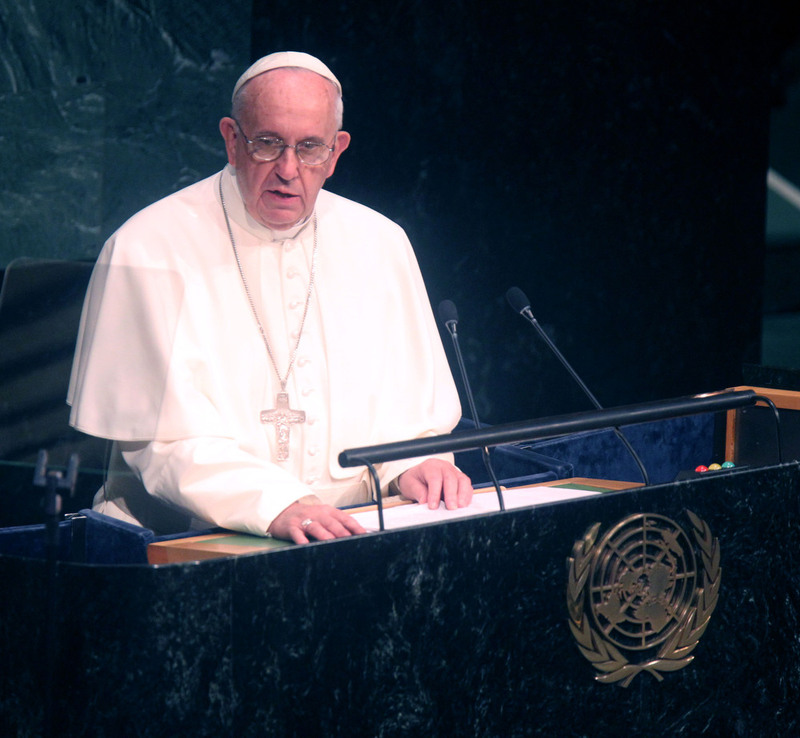 Francis visited Ground Zero following his address at the United Nations. The interfaith prayer service will include Muslims, Jews, Christians, Sikhs and Hindus. 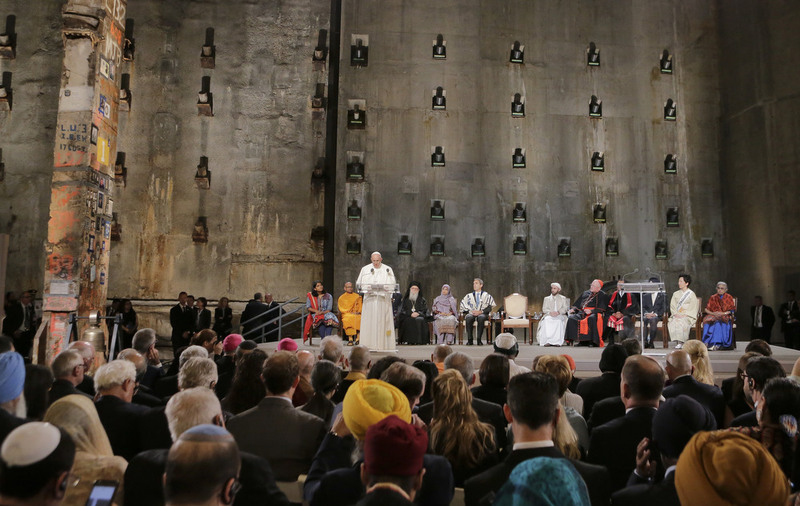 The Pope will also meet with family members of victims who were killed in the 9/11 terrorist attacks. 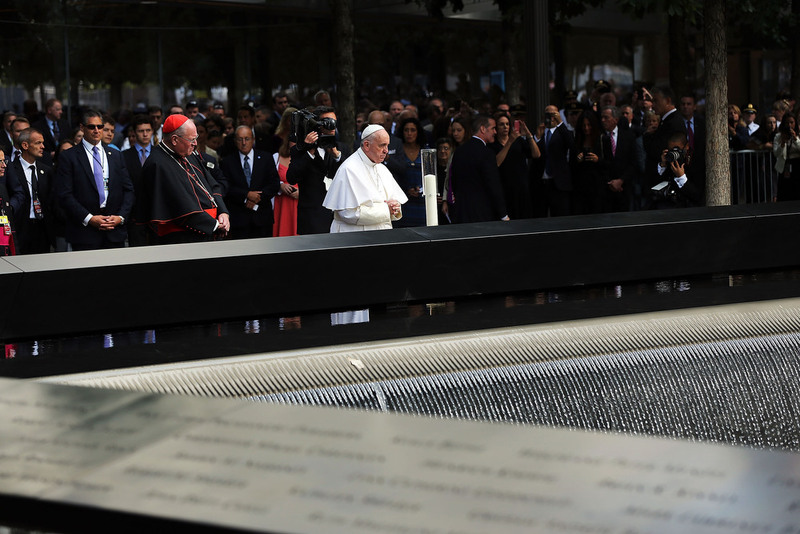 Pope Francis visits the 9/11 Memorial & Museum in New York City and prays at “Trying to Remember the Color of the Sky on That September Morning” by Spencer Finch on September 25, 2015 in New York City. 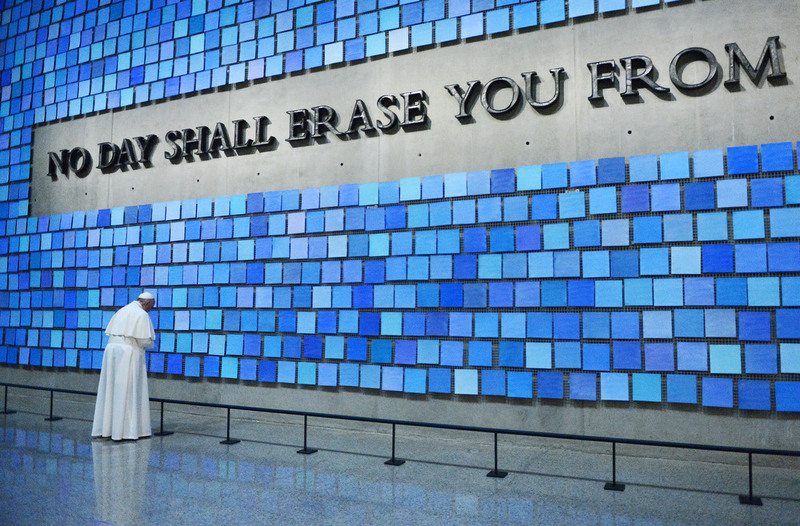 Reposed behind this blue wall are the remains of many who perished at the World Trade Center site on Sept. 11, 2001. 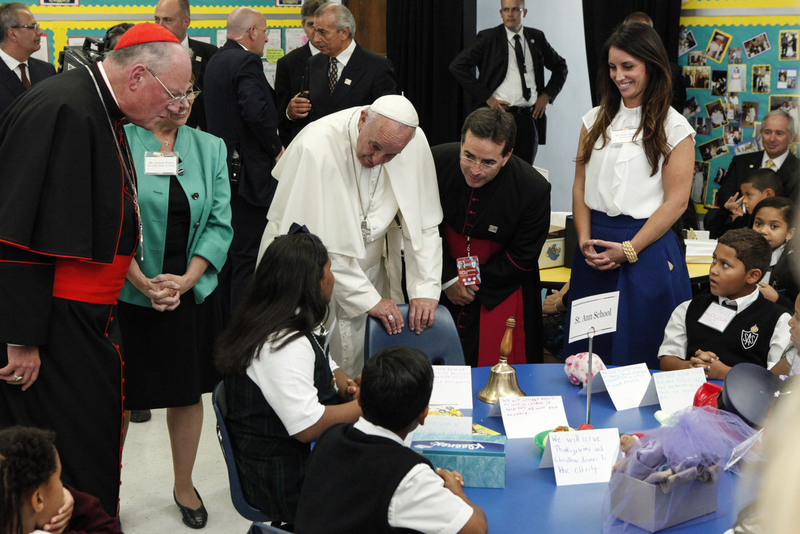 Pope Francis visits Our Lady Queen of Angels School September 21, 2015 in the East Harlem neighborhood of New York City. 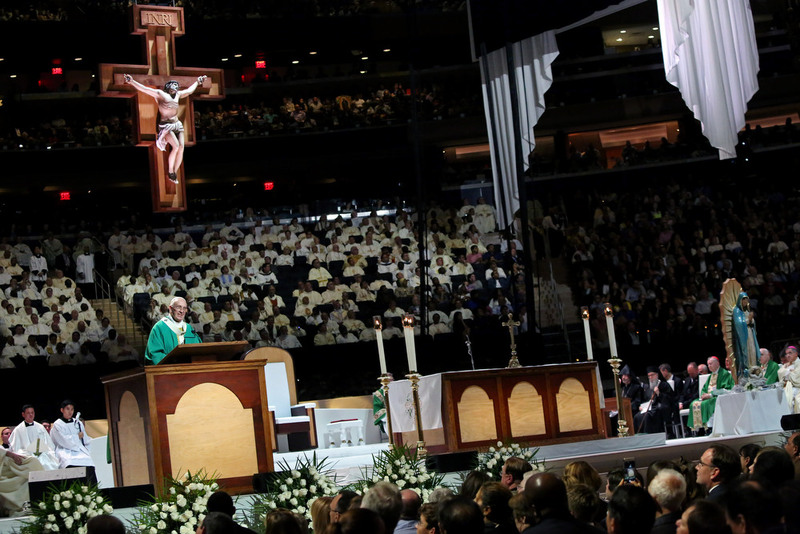 The pope is in New York on a two-day visit carrying out a number of engagements, including a papal motorcade through Central Park and celebrating Mass in Madison Square Garden. 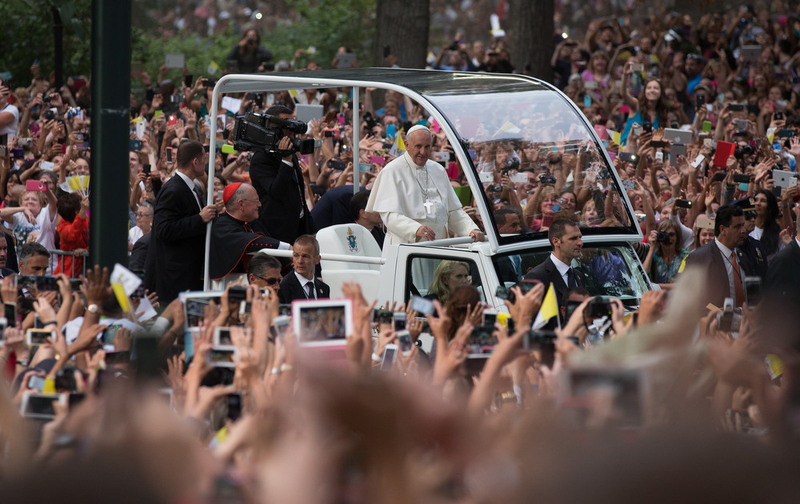 Pope Francis rides through Central Park in the popemobile on September 25, 2015 in New York City. Pope Francis celebrates Mass at MadisThe Pope is on a six-day visit to the U.S., with stops in Washington DC, New York City and Philadelphia. 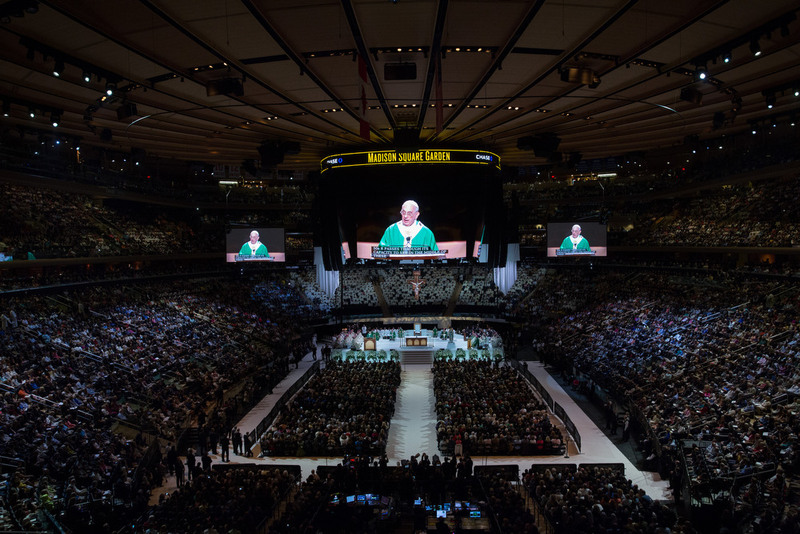 Pope Francis conducts Mass at Madison Square Garden in New York City on September 25, 2015. The Pope is in the midst of a five-day tour of the States, across New York, Philadelphia and Washington, DC, after three days in Cuba.